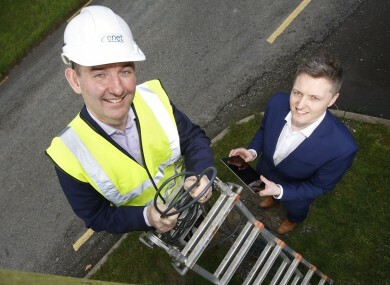 As part of our How My Business Works series, we profile Limerick broadband provider Enet. HERE’S A FUN family activity for a lazy weekend. Pick a random crowd of people and ask them whether they think Ryanair or Enet is a more interesting company. The first response is likely to be an immediate ‘Ryanair’. The second will probably be: “What in the world is Enet?” and Conal Henry knows this is true. Henry is the CEO of Enet, a wholesale broadband company which connects fibre networks in towns across Ireland, but previously held an executive position at the Dublin-based airline. When it comes to which one his friends are more curious about, there’s only one winner. “In Ryanair people were very interested in what I was doing, even if it wasn’t that interesting, whereas if you start talking to people in the pub about wholesale broadband you’ll be sitting by yourself pretty quick,” he tells Fora. Henry, who now lives in Dublin, has had quite a varied career. After graduating as a law student in 1991, he quickly went into finance and held a range of positions at several major companies, including the world’s biggest-spending advertiser, Procter & Gamble, and supermarket firm Asda. Belfast-raised Henry, 47, also worked for two years as commercial director in Ryanair just as the airline was starting to take off in the early 2000s. However, despite holding a senior role in one of Ireland’s most famous companies as it was starting to build its brand, Henry is much more likely to get animated when you talk about grocery shopping. Working in food retail was fast-paced and exciting, when I meet people from that part of my life we tend to have the most interesting conversations. You could try something new on the Friday and know if it was impacting on sales by the Monday or the Tuesday. “Ryanair is a phenomenal company and I think that Michael O’Leary is the best manager that Ireland has ever produced (but) as a business it does one thing: fly a Boeing plane from A to B. He says that Enet has given him more room to innovate. Henry is now trying to keep the company relevant and up to date in one of the fastest-moving industries in Ireland. During the late ’90s and early 2000s, Eircom was the only game in town when it came to providing broadband. The government decided that this was stifling competition and so decided to build fibre ‘rings’ around about two dozen regional town centres. Enet won a state tender to link these ‘rings’ with a central broadband network or connect them directly to large office buildings. The company, which has its head office in Limerick, now charges other broadband providers, like Sky and Virgin, to use the fibre networks that it created. The firms that use Enet’s lines are the ones that provide the broadband services to home customers. So Enet, in this relationship, is the firm that facilitates the operations of other internet providers by hooking up the fibre ‘rings’ to either buildings or ‘nodes’ – those telecoms cabinets at the ends of streets. In 2013, Enet was acquired by Granahan McCourt, a private investment firm specialising in telecoms and media. Granahan McCourt is owned by Irish-American David McCourt, one of the US’s most successful telecoms owners and investors, who is estimated to be worth about $750 million (about $697 million). McCourt has given Enet some serious financial muscle, with Henry saying: “Our new shareholders have invested about €100 million in Enet to date. Henry is coy as to how much companies have to pay to access Enet’s network, saying it varies hugely for each one. “It depends on how many buildings we are connecting at a time. If it is something like all of Athlone, the cost per building is quite low. But if you want to connect GMIT, doing it by itself is probably eight or nine times what it would be if it was part of that blanket connection,” he says. Enet is responsible for shouldering the cost of linking the lines and also has to give the government a share of its revenues. Staff is a big outgoing for the firm, which employs about 100 people, many of whom are highly skilled, as well as many sub-contractors who handle installation work. The company made a profit of €6.3 million on turnover of about €24 million in the 12 months to the end of April 2015, the most recent full financial year for which its accounts are available, roughly in line with its results from 2014. Enet provides the broadband infrastructure for some of Ireland’s largest telecoms companies. Huge multinationals, such as Vodafone, as well as smaller Irish companies such as Imagine, have been customers of Enet. Enet has also connected fibre broadband on an individual basis for some smaller businesses, like Claremorris-based DeCare Dental Insurance. Henry says that the company has about 60 telecoms customers in Ireland, many of which are smaller regional providers, and also provides provide fibre broadband services “for less than €100 per month to SMEs”. The Enet boss says that the company’s revenue sources “largely tracks Ireland’s population” with the exception of Dublin, where it was not required to link up the broadband network. We are in around 84 towns across Ireland. There are some outliers that do well, like Letterkenny, but if I showed you a map of where we get our revenue it would be similar to a map of the population. Like for pretty much every company involved in the telecoms industry in Ireland, the looming giant is Eir, Ireland’s big legacy broadband provider. “If you are looking to buy a network in the towns that we are in, it is invariably a choice between them and us,” Henry says. Enet is also one of the companies tendering for the National Broadband Plan, which will see high-speed broadband delivered to about 750,000 homes and businesses across Ireland, mainly in rural areas. Eir and Siro, a joint venture between the ESB and Vodafone, are considered the frontrunners to be selected for the project and will likely fight Enet tooth and nail to secure the contract. Hitting turnover of €50 million is the short-term aim for Enet and one that Henry says should be achieved in the “near future”, although he doesn’t specify when exactly that future lies. Beyond that, Henry says that Enet would like to look abroad, rolling out its business model of connecting towns to broadband in other countries with help from the deep pockets of its owners. “The UK is the obvious one, we are looking at it at the moment,” Henry says. “It is a medium-term aim, we will probably have it underway in the next 12 to 18 months. It is worth remembering who our shareholders are – one of the world’s richest men in David McCourt; and (well-known investor) John Gallagher knows how to make a few bob too. Henry himself says that he “loves” his job and what he is doing. He adds that there is “more variety” in his current job than in many of his other previous roles, and says he is “committed” to the company’s vision. Email “Inside the little-known company that brought broadband to dozens of Irish towns”. Feedback on “Inside the little-known company that brought broadband to dozens of Irish towns”.